If you have any questions or want to enquire about dates, use our form to contact Ian & Sarah Downing or see their website for more information. 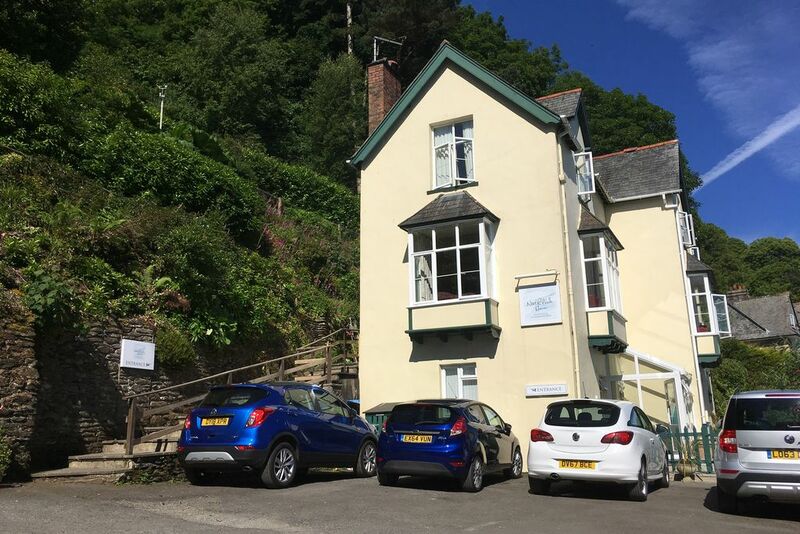 Sea views, brass bedsteads and big rooms at this calm retreat, perfectly positioned above Lynmouth Bay’s dramatic seascape – ideal for walkers and foodies. Ian and Sarah welcome you with homemade cake in a cosy guest lounge, and give you light bedrooms with sparkling bathrooms and inviting beds. Enjoy Exmoor’s coastal and moor walks, genteel Lynton and Lynmouth; return to log fire and armchairs. Take tea on the terrace, and be tempted by Sarah’s fine dinners, seasonal and mostly organic. The Downings are relaxed, engaging hosts, happy to share their enthusiasm for this lovely area. Stay a few days and really unwind. Dogs welcome in ground floor room. 1 November - 31 March. Dinner, 4 courses, from £27. Pub/restaurant 0.25 miles. Convivial good meals round the dining room table, colourful bedrooms, fantastic sea views and a terrace for sunny breakfasts. Really lovely hosts too. A warm, relaxing and welcoming place to stay. Wonderful views from the bedroom and beautiful terrace. Sarah’s hospitality and attention to detail deserves a special mention. We enjoyed delicious breakfasts on the terrace and Sarah’s homemade treats to welcome us back after a day out. North Walk House is tucked away on a quiet non-through road, and it is very handily on the coastal path to the stunning Valley of Rocks. Great to be able to leave the car and enjoy amazing walks, views and attractions from the doorstep. We would highly recommend North Walk House. Late putting together our comments, but this is no indication of our joy at staying here. Very comfortable and the food was great. Ian and Sarah always on hand to ensure our stay was enjoyable. The Area is great for walking. Ian and Sarah could not do enough to make our four night stay more enjoyable. The room was well furnished and the bathroom was excellent with large soft towels. What a wonderful place to stay: Sarah and Ian are as warm and welcoming as is their house. They prepare wonderful local food and go out of their way to make sure that you have everything you need from flapjack in our rooms to restaurant bookings and local information. North Walk House is in a superb position, with views across the estuary and beautiful walks on the doorstep. Add this to the easy access to both Lynton & Lynmouth and you have the perfect ingredients for a perfect holiday. This place is one in a million - we absolutely loved it! Sarah and Ian really made us feel at home and we were so well cared for. The communal dining made our stay extra special as we met some really lovely people. Nothing was too much trouble for Sarah and Ian. The rooms are very well appointed, the food and menu are excellent - and all the extra touches like home made flapjacks made it extra special. We can thoroughly recommend it and cannot wait to go there again! Three aspects in particular made our stay at North Walk one of our most enjoyable breaks ever. Firstly, the welcome from Ian and Sarah consistently gave a sense of enjoying having guests rather than a simple money-making exercise. Secondly, the use of local seasonal food together with the couple’s skills in the kitchen resulted in a series of wonderful meals both at breakfast and in the evening. Finally, the many glorious walks right from the door meant that we did not use the car once during our four night stay. Overall, the best B&B we have ever stayed at in the UK. We chose North Walk House in large part because they specified on their web site organic food and the ability to deal with special dietary needs, confirmed by a phone conversation. (The appealing rooms and views helped as well.) They more than lived up to that promise - Sarah's cooking is first-rate, and took account of a gluten-free diet with allergies to several other common foods, without sacrificing taste or quality in the least. Breakfasts are as wide-ranging as anyone might want, from full English to (home-baked) toast and jam - the Aga-baked egg and bacon is especially recommended. 400 feet from the sea, but vertically! Beautiful views of Foreland point and across the sea to Wales, 25 miles away.Explore the delights of Exmoor with walks short and long, many straight from the house. Siton the terrace, walk up through the garden to Hollerday Hill, stroll along the cliff path on a fairly level walk or take in the ups and downs of circular walks along the coast path or in land to the moor. Explore the old twin villages of Lynton and Lynmouth. Try the cliff railway that links the two.A little further afield takes in country market and seaside towns of interest, National Trust sites and interests like the ancient bridge at Tarr Steps. Right on the South West Coast Path, so stop as you walk through or take in the circular walks that end up back in our sitting room for tea before a relaxing dinner. Exmoor, beasts(! ), ponies and red deer, Valley of Rocks and its goats. A Variety of good eateries or book at North Walk House for organic, seasonal food.